Packing and prepping for a summer road trip with kids can be a task that may leave even the most seasoned logisitics officer with weak knees. Between packing, paying the bills, cleaning the fridge, finding a sitter for the dog, and taking out the trash, you wonder if you’ll ever get on the road. The USA License Plate Game is a fun way to keep the kids happy on your next road trip. That usually means that if the kids are happy – mom is happy! After a while, your brain turns to mush, you know you’ve forgotten something, and your inner voice keeps chanting “Let’s just get in the car. Let’s just get in the car.” But before you do, consider the drive itself. You know that it is only a matter of time before you hear the dreaded, “How long till we get there?” Take a moment to delay the inevitable by packing a few of our favorite Sanity-Saving Road Trip Essentials. An Interactive Travel Game – A game that requires the kids to notice and observe the things they are driving by is not only a great way to pass the time in the car, but it forces them to look outside of the window. One of our favorites is the USA License Plate Game. 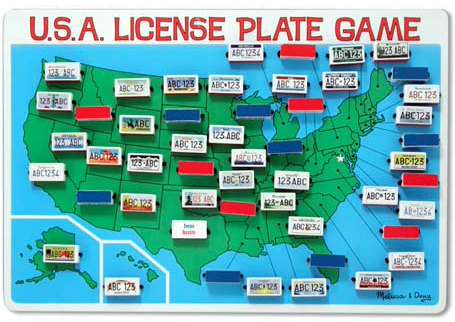 The game centers around finding as many state license plates as possible, but the game can be played several ways to challenge everyone from kids to adults. A Travel Trivia Game – Keep the whole vehicle occupied with a trivia style game. The Trip Talk Travel Game is one of our favorites, and it is perfect for the whole family. An Audio Book for Kids – In our house, audio books rule the road. Many a happy (and silent) mile have passed by due to a good “listen”. The Sugar Creek Gang Series is at the top of our list, but there are so many options that your biggest problem may be choosing only one! Reusable Sticker Books and Coloring Books – For the younger kids, a reusable sticker book is a great way to pass the time. There’s no mess and no fuss, and on a long road trip – that’s a good thing! The Reusable Vehicle Sticker Pad is one of our favorites.